1) From the Director of School Education,Telangana, Hyderabad, Lr.Rc.No.330/PS2-2/ 2015, dt.23.8.2015. 2) The Director of School Education is requested to follow the Guidelines for the appointment of Vidya Volunteers for the year 2015-16 as mentioned in the Annexure enclosed scrupulously. 3) The Director of School Education, Telangana, Hyderabad shall take necessary action in the matter accordingly. 1.The Vidya Volunteers will be engaged from 21st September, 2015 to 20th April, 2016 for the schools as approved by the Director of School Education. They are purely temporary and can be terminated before 20th April,2016 also based on justifiable grounds by the School Management Committee (SMC). 2.The Vidya Volunteers shall be engaged to ensure regular functioning of the schools . 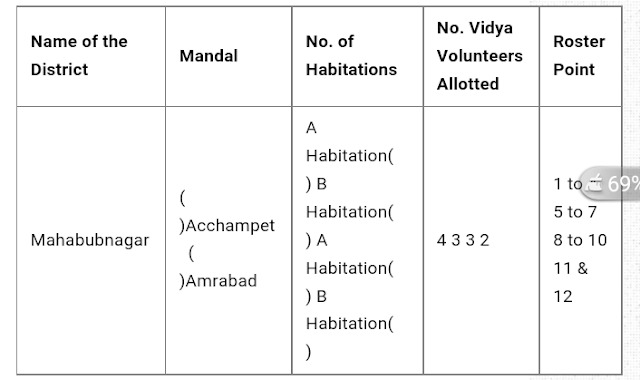 5.The DEO shall communicate the list of schools along with roster points to the Mandal Educational Officer concerned for engaging the Vidya Volunteers. The Mandal Educational Officers in turn shall display the details on the notice boards of the Mandal Resource Centers, Primary Schools ,Upper Primary Schools, High Schools and all Gram Panchayats in the Mandal . The District Educational Officer shall give press note stating that the eligible candidates shall apply through on-line and display the details on his website. 6.The Candidates shall apply online and submit a signed print out of the application he/she uploaded along with the Certificates required, to the Mandal Educational Officer of the Mandal to which he/she applied within the time specified. The Mandal Educational Officer shall cause verification of the applications with reference to the Certificates enclosed and submit to the District Educational Officer duly countersigned. Upper Primary & Secondary Schools(Classes VI to X): Graduation with B.Ed. & Above. Graduation with the language concerned as optional and Pandit Training or B.Ed., in the relevant methodology.Post Graduation in the language concerned with Pandit Training/ B.Ed. with relevant methodology. Oriental Title/ Bhasha Praveena/ Vidhwan in the Language concerned or its equivalent with Pandit Training/B.Ed in the relevant methodology. Mandal is the unit for engaging of Vidya Volunteers basing on the roster points allotted to the Mandal. Merit lists shall be generated for each Mandal. As far as possible Candidates belonging to the same Mandal shall be engaged as Vidya Volunteer. If qualified Candidate is not available for a particular roster point in the Mandal, Candidates from the other roster points may be taken from the same Mandal. Example : If no ST (W) Candidate is available in the Mandal , ST (Men or Women) i.e., General (G) may be considered . If no ST candidate is available in the Mandal , SC (W) may be considered . If no SC (W) Candidate is available in the Mandal , SC (G) may be considered . If no SC candidate is available in the Mandal ,following sequence shall be followed BC A (W),BC A (G),BC B(W), BC B(G),BC C(W), BC C (G),BC D(W), BC D (G), BC E(G) , OC(W),OC(G) . If Candidates are not available in the Mandal , same category of Candidates from neighbouring Mandals may be considered based on merit. The Director of School Education, Telangana, Hyderabad shall draw a detailed Schedule and communicate the same to the competent authorities to engage the Vidya Volunteers.